Introducing Inner Moonlight, our monthly poetry reading series! The first Wednesday of every month we’ll host 2 poets and we’ll wrap up with 15-minute open mic. All this wouldn’t be possible without the invaluable help of local poet Logen Cure, who’ll be curating this soirees. For that we’re immensely grateful. 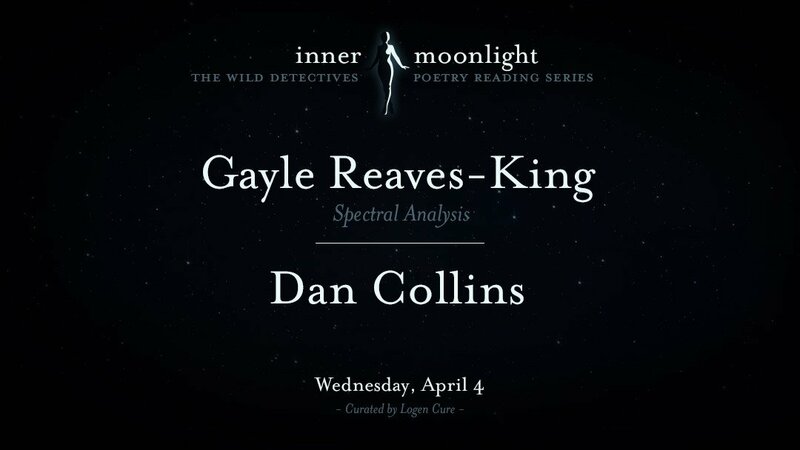 And we couldn’t be more excited about our first line up: local poets Gayle Reaves-King and Dan Collins. Gayle Reaves-King is a journalist and a poet. She has worked at major daily papers like The Dallas Morning News and small ones like Fort Worth Weekly, which she edited for 14 years. Her journalism awards include a share in the 1994 Pulitzer Prize in international reporting, for a Morning News series on violence against women. She’s currently an adjunct professor of journalism at UNT and freelances for regional and national magazines. Her chapbook Spectral Analysis was a runner-up in the Dallas Poets Community contest and her work was featured last year in the Art&Words show in Fort Worth. She’s part of the brain trust at Pandora’s Box Poetry Showcase and for the last three years has edited the Best American Newspaper Narratives anthologies, published by UNT Press. Commercial Printer by day, Dan Collins is an artist and poet active in the creative community of Dallas, Texas. His work has been published in Blue Mesa Review, Naugatuck River Review, Entropy, The Boiler, and Out of Nothing. Forthcoming publications include The New Guard Vol. VII and Redivider 15.2. He is a “brain trust” member of Pandora’s Box Poetry Showcase, a Cloudwerker, a White Rock Zine machinist, and Co-owner of Tree House Studio. So now you know what to do on the first Wednesday of each month. We’ll be waiting for you. —Allen Gingsberg, from On Being a Writer.